Severe storms every day of week for middle-U.S.
A stormy pattern is setting up in the middle of the country, and it's expected to remain there the entire week. The threat of damaging thunderstorms and a few tornadoes will linger in the Plains all the way through Friday. The main threats this week will be strong, damaging winds and large hail. A few tornadoes are also possible during the week. Some of these storms could also produce heavy rain, leading to localized flash flooding. 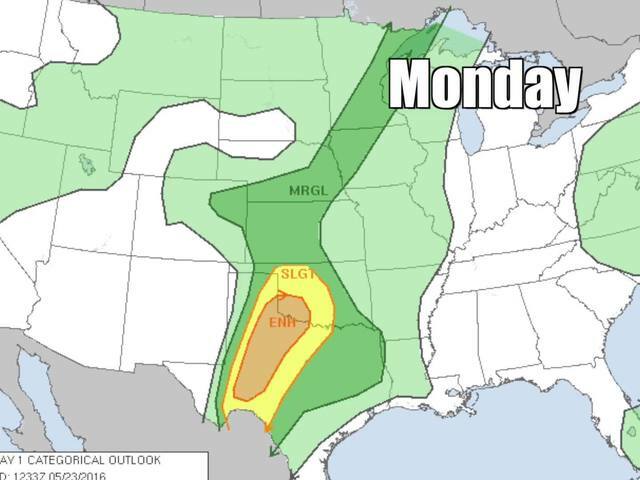 Parts of north and west Texas saw a number of tornadoes on Sunday, and it'll be the same system hitting the Plains and parts of the Midwest this week. Severe thunderstorms can develop quickly, so make sure you and your family have a plan and know where to go as soon as a warning is issued.